Defense wins championships, right? Normally, that is a rock-solid argument. In recent years, however, there have been some statistical anomalies that have belied that old adage. When the Carolina Panthers’ unstoppable offense meets the Denver Broncos’ impenetrable defense on Sunday, the whole world will be watching with intrigue (even if only for the commercials). There will be other facets of the game and a variety of plotlines, but the real intrigue lies in whether another top-ranked defense can reign supreme on football’s biggest stage. The Broncos know all too well what an elite defense can do in a Super Bowl, having been on the wrong end of some dominant performances in the big game in the past. Whether it was the 1977 Dallas Cowboys’ “Doomsday” defense, the 1986 New York Giants, or the Seattle Seahawks of just two years ago, the Broncos have been embarrassed in past Super Bowls by smothering defensive units in the title game. This time around, they have a chance to do the smothering, as the Panthers come in with the league’s highest-scoring offense (they scored 500 points in the regular season and 80 more in two playoff wins). If this plot sounds familiar, it should; in Super Bowl XLVIII, Denver came in with a record-setting offense that scored 606 points during the regular season and was favored against the league’s stingiest defense of the Seattle Seahawks. The result was a 43-8 Seahawks demolition. The Super Bowl’s recent blowouts have all been posted by squads that were considered “defensive teams,” like the Seahawks, the 2002 Tampa Bay Buccaneers, and the 2000 Baltimore Ravens. What’s odd, however, is that it hasn’t always worked out that way, especially in recent years. Consider this: of the last nine Super Bowl matchups, seven of the nine teams that came in having allowed more points per game during the regular season emerged victorious. That included the New England Patriots last year against a Seattle club that was first in both points per game and total defense. In Super Bowl XLV, the Pittsburgh Steelers were the top-ranked scoring defense (the Green Bay Packers came in ranked second) and second-ranked overall (the Packers were fifth). The Packers won, 31-25. And in both of their Super Bowl wins, the New York Giants came in with a lower-ranked scoring defense than the mighty Patriots, including a paltry 25th in 2011. The Broncos wasted little time in transforming into a defensive-minded team after being whitewashed by the Seahawks. General manager John Elway, himself a three-time Super Bowl victim in the 80’s, aggressively pursued a number of high-profile defensive free agents such as defensive end DeMarcus Ware, cornerback Aqib Talib, and safety T.J. Ward. 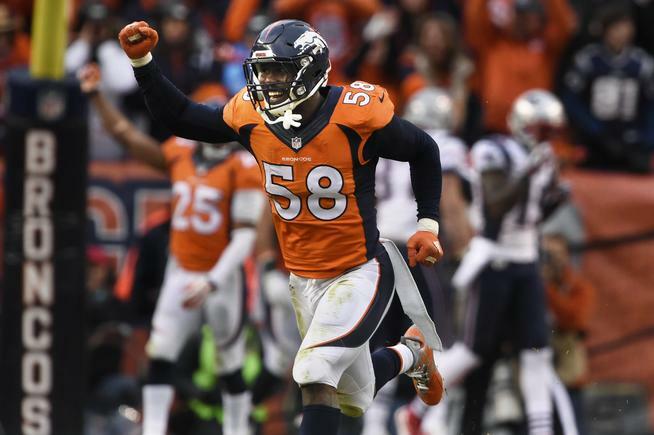 Outside linebacker Von Miller, the first player Elway drafted back in 2011, is coming off an epic AFC championship game performance in which he notched 2.5 sacks and an interception. Miller missed the Super Bowl two years ago with a torn ACL. Denver’s defense is not only stacked, it’s fast, aggressive, and sometimes even intimidating. It’s the same formula the Seahawks used to impose their will on the Broncos two years ago. Dynamic quarterback Cam Newton represents arguably Denver’s biggest challenge to date in 2015 (or 2016, as it were). Though the Broncos hit Tom Brady repeatedly in the AFC Championship game — an estimated 20 times by the team’s count — the two biggest opposition quarterback performances came from another elite passer in Pittsburgh’s Ben Roethlisberger. Through all of this, let’s not sleep on Carolina’s defense, either. In that oft-mentioned 2014 Super Bowl, the Broncos came in ranked 22nd in points allowed and 19th in total yardage. The Panthers enter this contest ranked sixth in both scoring and total defense. Though the Panthers did not return an interception for a touchdown during the regular year, all-world linebacker Luke Kuechly has notched a pick-six in both of Carolina’s playoff wins. Peyton Manning may have been rattled early and often by the Seahawks in his most recent Super Bowl, but he also knows statistics aren’t everything. In his first appearance – and only win to date – his Colts defense came into Super Bowl XLI ranked 23rd in scoring defense and 21st in total defense. By comparison, the Chicago Bears were third and fifth in those respective categories, and Manning still nabbed MVP honors in that game. Against New Orleans in Super Bowl XLIV, the 20th-ranked scoring defense and 25th-ranked overall defense of the Saints held the Colts to just 17 points, and sealed the win with a pick-six by cornerback Tracy Porter. Many pundits will argue that the true difference in Super Bowl 50 will be the supposed “weak links” of the two teams, which would be Denver’s offense and Carolina’s defense. That is a very loose term, because of Carolina’s aforementioned sixth-ranked D and Denver’s multifaceted rushing attack. Though the Broncos’ offense ranked in the middle in terms of yardage, Manning is no slouch, even amid the perception that he’s too old, too slow, and no longer has any arm strength. The intangibles are where the Broncos could have a decisive edge. Everyone is suddenly on the Panthers’ bandwagon, after ripping them for benefitting from a soft schedule all year and being massive overachievers in a weak NFC South division. The Broncos, who started 8-0, suddenly lost the national media’s respect after Manning’s worst career performance – and subsequent foot injury – in a Week 11 loss to the Kansas City Chiefs. How quickly perception can change. For years, the Super Bowl favorite seemed to be a shoo-in, but not of late. Five of the last seven underdogs have won straight up, and Denver enters this one as a six-point dog. Manning, in what very well could be his final game, may be far from his peak, but he also may have his best supporting cast in terms of a fully-balanced team. Then there are these questions to ponder: Will Manning really lose a third straight Super Bowl? Will a team that went 5-2 against playoff teams in the regular season (more wins against playoff teams than anyone in football), and is 2-0 against the mighty Patriots, roll over in yet another Super Bowl despite having a dominant defense this time around? And how about the team deciding to where white jerseys, which has translated to a win for 10 of the last 11 similarly-clad teams in the Super Bowl? Another factor that is going seemingly unnoticed is the Broncos’ uncanny ability to win close games. They enter the Super Bowl having won 11 games decided by seven points or less, breaking the record held, ironically, by the 2003 Carolina Panthers (as well as the 1978 Houston Oilers). That Panthers squad had been the only Carolina one to reach the Super Bowl until this one. Perhaps this is wishful thinking, and the Panthers really are as good as advertised. They aren’t 15-1 by accident, and Newton is a now a bona fide star, having done more with less of a supporting cast than just about anybody in recent memory. But after being burned going with Denver two years ago, I’m banking on better luck taking them this time around. How about a win and a ride off into the sunset for Peyton Manning? Prediction: Broncos, 26-24. Be the first to comment on "Super Bowl 50 Preview – Cam vs. Peyton, and Lots of Defense"